Job seekers needing to reinvent themselves for today’s challenging economy may not have funds available to pay for the services of a career coach. Just in time, Seattle-based career counselor/coach Halimah Bellows, MA, MS, CPC has designed a set of CAREER QUEST CARDS TM © that offer a unique and affordable strategy for developing a fulfilling new career. 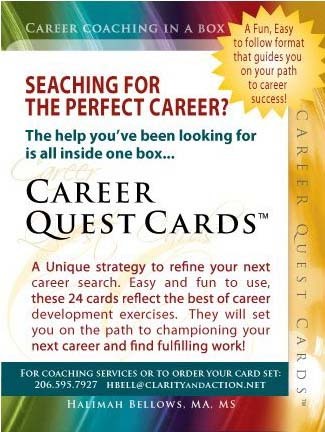 Packaged in a convenient, portable 4½-by-6-inch clear plastic box, the set of 24 CAREER QUEST CARDS TM © provides a distillation of 30 key career-coaching exercises. The cards are color-coded in five categories, allowing an individual the flexibility to work with the cards randomly or use them in a sequence that suits his or her own learning style. Individuals are encouraged to keep journals to track discoveries that they make about their values and preferences in the process of doing the exercises.